Here’s what you get for dishing out $25,000 to attend Governor Charlie Baker’s inauguration. Just days after he coasted to reelection, Governor Charlie Baker’s campaign has begun soliciting donations of up to $25,000 from individuals and corporations to bankroll a slate of inaugural events around his Jan. 3 swearing-in. The requests for high-dollar contributions come with promises of a “candlelight” dinner, “VIP access” to the governor’s “signature” inaugural celebration, and recognition on “all printed materials” for the planned events, according to documents obtained by the Globe. Baker and Lieutenant Governor Karyn Polito officially reopened their inaugural committee on Tuesday, state campaign finance records show. But it had already begun soliciting cash in the days before, according to an e-mail Tim O’Leary, a campaign aide, circulated this week to several hundred of Baker’s top donors and supporters. “Governor Baker and Lt. Governor Polito would not have won reelection without your generous support and commitment,” O’Leary wrote. Baker, a Republican, rolled over Democrat Jay Gonzalez in last week’s election, 67 percent to 33 percent. 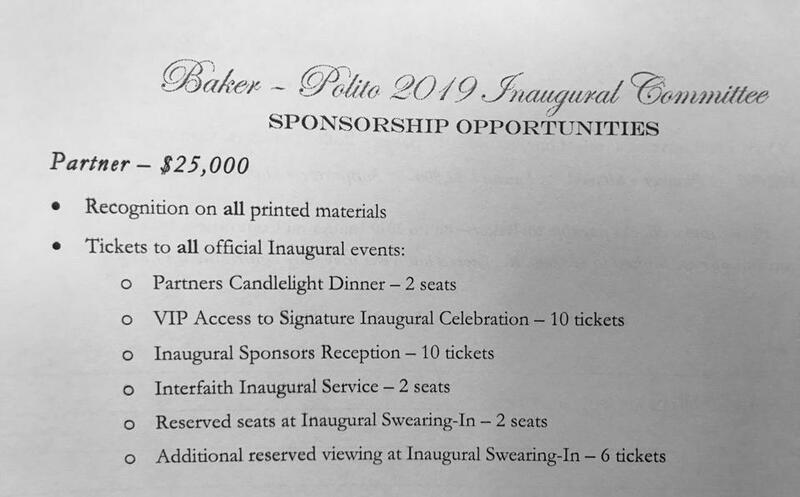 While there are no statutory limits on donations, Baker aides have set a self-imposed cap of $25,000, following a practice from his 2015 inauguration. And they’re limiting lobbyists to $200. Four years ago, some of the state’s marquee companies, from New Balance to Raytheon, cut big checks to the inauguration effort. For the 2019 event, a maximum donation — dubbed a “Partner” contribution — will score a supporter two seats at a candlelight dinner, 10 VIP tickets to the committee’s “signature” inaugural celebration, and two reserved seats at Baker’s swearing-in. If the $25,000 is too rich for some donors, they could be a “pioneer” ($10,000), “patron” ($2,500) or “supporter” ($1,000). The pioneer status, for example, gets them mentioned on the inaugural gala program and invitation, and tickets to a range of other events. Baker aides said the slate of events is still in development, though they’re expected to span different parts of the state during the week of the inauguration. Aides also say there is no formal fund-raising goal, but that they don’t expect the cash haul to exceed Baker’s 2015 inauguration, when he raked in $2.4 million to fund the most expensive inaugural celebration in state history. It was replete with 22 events and a crowd of 7,000 at his inauguration night party at the Boston Convention and Exhibition Center. At the time, Baker took dozens of separate donations of $25,000 from companies such as Bank of America, Steward Health Care, Blue Cross Blue Shield of Massachusetts, and his former employer, Harvard Pilgrim Health Care. And his campaign continued to accept donations for months after the January celebration, doling out checks to various charities in the process. Baker aides did not fully disclose all of the committee’s operations. They pointed to state requirements, which mandate that they report the donors and the amounts they gave, but not how the money is spent. Baker aides said Wednesday they have already collected some donations for January’s celebration and will disclose totals when required by the Office of Campaign and Political Finance. Jim Conroy, a Baker adviser, said giving the committee cash won’t afford a donor any special access to the administration. “As with the campaign, the inaugural committee intends to strictly comply with both the letter and spirit of campaign finance regulations and disclosures — and additionally has self-imposed a limit on contributions,” Conroy said, referring to the $25,000 cap for most donations and the $200 cap for lobbyist donations. Pam Wilmot, the executive director of Common Cause Massachusetts, said the potential for vast amounts of money to flow in from powerful corporations with interests before state government demands a greater level of transparency than state law requires. Baker’s 2015 bash topped former governor Deval Patrick’s 2007 celebration, for which the Democrat sought donations up to $50,000, and ultimately raised $1.9 million, the Globe reported. Patrick took in far less to ring in his second term in 2011, collecting nearly $650,000 in donations, according to state records. The Massachusetts Constitution dictates that Baker be sworn in by the Senate president at noon on the Thursday following the first Wednesday of January, which this year falls on the third. The constitution’s framers made no mention, however, of candlelight dinners. Reach Stout at matt.stout@globe.com. Reach Miller at joshua.miller@globe.com.